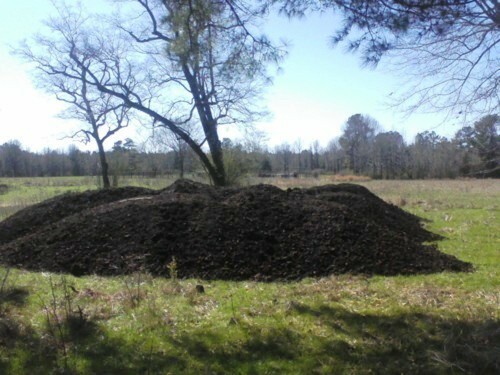 Chicken Litter, or composted poultry house bedding and manure. Driving through the back roads and state highways of Arkansas, there is that familiar scent of litter being delivered to the pastures. The poultry industry is big in Arkansas and those producers have found a great use for their wastes. Composted poultry litter makes a great fertilizer for livestock producers and crop farmers, adding organic matter to the soils and serving as a great source of nitrogen, phosphorous, and potash. Poultry litter is often cheaper than commercial fertilizers (depending on distance), serves as an organic matter fertilizer, and helps support local agriculture. Before spreading poultry litter, perform soil tests to determine fertilizer needs, and determine nutrient value of litter to be used. Recommended application rates vary, but are usually close to 2.5 tons per acre. Applying poultry litter as fertilizer can increase forage yields up to 16% or more in some cases. Poultry litter has been used in cattle diets for more than 40 years. Because of the ability of the rumen to digest fibrous material, litter serves as a low-cost feed source for inorganic nitrogen. Most broiler operations produce 1.2 to 1.7 tons of litter per 1,000 birds. For a flock of 18,000 to 20,000 birds, this amounts to between 22 and 34 tons of litter per flock. Have you ever used poultry litter in a garden plot or as a source of organic matter in field leveling? Do you use poultry litter as a fertilizer or are you a poultry producer? Let me know. I’m sure at least you have a story about that wonderful scent. Next Why Are You AgProud? Our little town, the biggest in the county, really gets the grumbles when farmers use this fertilizer on the ground. The farmers sometimes stock pile it on the ground or spread it without working it in. Part of me understands the smell issue, but the other part says when yo are surrounded by farm ground, live in the county with the largest farms in Indiana, are the thirds smallest in population, and ag is your main industry, you are going to have some smells to deal with. We raise feeder cattle so we use a lot of that to fertilize our ground close to the house. We also have 2-3 large hog CAFOS and two large dairy farms in our county. If I drive to Lafayette, I smell Staley’s (corn processing plant) city smells. It’s all a part of our living place choice. People have to give a little to have healthy safe food in their freezer. You aren’t in the country unless you can smell chickens or cows! I’ve found Turkey litter makes the garden grow giant plants. Never had those results with chicken litter.